Scans from Empire, via ComingSoon. 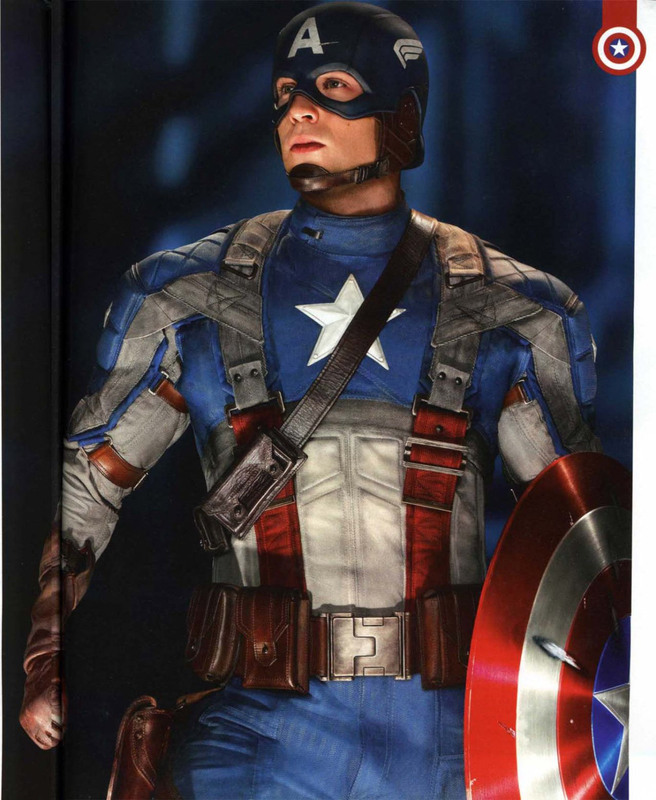 The problem with Cap is that, comics/cartoons being abstract mediums, it’s generally been kind of hard to get a handle on what he’s actually supposed to be wearing – the “blue part” of the suit is usually supposed to be some kind of armor, until-recently that was usually “visualized” by drawing little curve-mark “scales” all over it. When Alex Ross paints him, it usually ends up looking like plate-mail. Most of the time artists just say “eff it” and treat it like the standard painted-spandex onesie. But I REALLY like this. You almost never see one of these made out of practical-fabric, which really makes the “muscle-padding” work a lot better than they do in rubber. Above all else, you can tell it was built to MOVE, so hopefully it won’t have the Batman Problem where the fight scenes all happen “around” a main character who can (very obviously) barely lift his own feet. ALSO: Samuel L. Jackson confirmed on Jimmy Fallon’s show (so that DOES exist!) that Nick Fury is set to turn up in both “Captain America” and “Thor” – the Thor part is news, previously it’d been said that he wasn’t in there. This would also seem to confirm that we’ll see Cap’s arrival in the present-day in the movie (or at least after the credits) since Fury couldn’t possibly have appeared in WWII. Although… this does bring up the still-wonky question of how OLD Nick Fury is actually supposed to be in these. In Iron Man 2, he says he knew Stark Sr., who has been dead a good amount of time already as that series opened. Movie-Fury looks like the “Ultimate” version, who’s just a regular secret agent; but the traditional Fury is actually slightly older than Cap is, and has been kept artificially young(ish) by a serum derived from the stuff that created Cap in the first place – he was original a WWII-era character, “Sgt. Fury,” and some version of his team “The Howling Commandos” have been rumored to turn up somewhere in the Cap movie, so… who knows. Escape to the Movies: "The King’s Speech"
It could create a very interesting dynamic if they kept the “Nick Fury is kept young by the same serum” element, so it doesn't necessarily mean we'll be seeing Cap in the present (or not-too-distant-future or whatever) in the first movie. Bob, you may not be so familiar with Ultimate marvel. In Ultimate Origins mini series it is revealed that in fact the Nick Fury of Marvel Ultimate universe is a super soldier. If memory serves well, he was a supposed war criminal. The prison that's holding him was testing the super solider serum on African American prisoners. He was the only survivor of the serum and escaped prison with his newly gained physique. He later fought many war with different alias including Gulf war where he met Wolverine, as Bendis's attempt to glue things together. Captain America is looking like the only Superhero movie worth exactly seeing this year. Never been a fan of the “muscle padding” thing. Looks a bit ridiculous in my opinion. Although I like everything else about it. Not a fan of seeing Fury in WW2 days. Unless they make him a major character which I imagine is a bit far fetched, I think the time spent explaining his origin to the audience could be better used. You know this whole situation feels a bit unreal. Never thought I'd be this excited to see a “Captain America” movie. Although “Thor” is still the highlight in the upcoming releases for me. I always saw the Ultimates version of Fury as a way for the Ultimate universe to fudge a black character into the Ultimates universe with Sam L. Jackson's likeness for the sake of sales. Fans mostly lost interest in the character after they de-Steranko-ified him and instead Hasslehoff-ified him because the Steranko version was too edgy and politically incorrect (i.e. Rated-R action-comedy material starring a dude who's saving the world…… whether we like it or not). Sad, the Steranko era Fury is the best one….. damn political correctness….. In the Ultimates universe, he was the first super soldier, predating Steve Rogers. They basically fudged together the origins of Nick Fury and Isaiah Bradley (the first super soldier in the main Marvel Universe, who is a black Captain America from the “Truth: Red, White and Black” story arc). Speaking of costumes, I finally noticed what has bugged me so much about Batman's live action cape 'n' cowl…it's the eyes. I know it's completely unrealistic and wouldn't work in a live-action setting, but, in my opinion, Batman just needs the completely white eyes to work. @jameshayes: Yeah, the cowl worn by Christian Bale was – in part – specially designed to adhere to the odd shape of his head. That's why he doesn't have the iconic silhouette Keaton and the others had. Aside from the eyes, there's also the more organic looking features around the nose (sculpting of the nostrils) and brow, which just look really odd. His chin and jaw are, unfortunately, quite narrow and not as broad as the other actors who have portrayed Bats, which affects the look of his head in the cowl. I don't care if this movie fudges anything up, I want to see this suit in action. Hugo Weaving as Red Skull? yes please. I'm hoping to God the trailer is just as awesome as Thor's. It's high time the Marvel properties got their dues in movie made by people who actually seem to give a damn. Heh, that's right, I didn't realize that before. There's a lot of other things that bug me about Batman's live-action costume as well – the Bat-abs are one of them. I get it, batman has a rippling chest in the comics, and so his tight-fitting top shows it all off, but, really, the fact that, in the comics, he's inhumanly built doesn't particularly matter to me. When, in any live-action movie he wears a sculpted “armour” set….it just looks bad.